We are a locally owned franchise of Terminix International that has been serving west Michigan for well over 60 years. All of our pest management professionals are state certified, they have undergone extensive training and are bonded. Our entire staff attends continuing education courses in new pest control techniques and customer service regularly. Technician who provided service to my property was very courteous and informative. Really liked the technician that did our job this last time. He was new to our route. Technician was very corteous. Always does a thorough job and answers all of my questions in depth. Listens to any concerns I have and explains actions taken to correct those problems. Service was good. Can't sign into the website though. Things went well this year . The big test will be o. The spring to see if the ants and bees are really gone 😊. 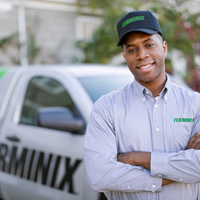 The Terminix team member that services my home is always friendly and professional. He always inquires if we've had any pest problems. I'm very satisfied. Best service ever! My dealings with Tammy in the office are always helpful and professional. My service rep,Christian does a thorough job and we always discuss the service and if we have my other concerns that he can help us with. He had us sign up for all year service due to our struggle spring and summer with ants. No one ever has discussed this with us and we have been with Terminix for years! I am totally happy with my service! Great Service. Prompt, Friendly, easy pest management. The technicians are very friendly and informative. The response time is perfect! We have had every problem resolved without issue. I highly recommend Terminix. From the first visit and application of pesticides to our most recent one, the service has been excellent, provided by friendly and informative workers. And we’ve had no problem at all since the first application. We’ve praised your services to others and hope they may have called you. Thank you for your kind and thoughtful review! We appreciate you recommending us to others and are very happy to have you as a customer! The entire team is responsive, friendly, and helpful. Not only have they resolved my issues on multiple occasions, but also spend the time to explain future preventative measures and really help me understand my problem(s). Major shoutout to Pat, Chris, Brian, and the rest of the team at Terminix of West Michigan! Terminix is reliable and did a good job for us. Very happy with their service and pricing. No more ants! You did a great job. I would recommend to anyone. If I wasn't moving I would surely use terminix every year for maintenance upkeep of my home. We are very pleased of the service that we have been receiving for the last 2 years. We have not had any problems with any insects or rodents for 2 years. Thank you for your service and we highly recommend Terminix. Thank you, Tim! We are grateful to have you as our customer! Chris is very professional and always friendly. Christian is very thorough, and such a nice guy. He is a keeper! I appreciate that your company will come out in between visits (no extra charge)in case we see a number of bugs. Appreciate the phone call stating date of service and telephone number to reschedule if necessary. Also service is always provided on the day scheduled. Service person very polite and efficient. I have used Terminex in several houses over the years. They have always given prompt courteous service at a reasonable price. Their technicians are well informed. Dan is always a pleasure to see. His help is invaluable. How lucky you are to have such a great employeee. The terminix associate arrived promptly and effectively assessed the extent of the damage. He then explained what the treatment plan and told us what to expect after the treatment. He then proceeded quickly and efficiently. The 16 days we had to wait for the service was annoying, but we are very satisfied with the service. I am very happy with the services provided. I have not seen one ant since the day they treated the house. Thanks a million!! Excellent service. Been customer for over 10 years. Will continue to be for years to come. Arrived in on time. Got right to work. Did a good job of covering the house inside and outside. Yes I'm very happy with your service . I am very happy with the service we received. We usually kill about 2 spiders a day in the spring and summer, however, with this service, we have seen 2 spiders within about a month! Will definitely use Terminix again in the future. Quick, reliable, and friendly. Highly recommended. Very happy with my service. Chris is a great tech! Quality work at a fair price and all our ants and bees are under control. Tech is always on time and friendly. Glad to have their expertise . You guys are the best! You’ve kept my home relatively insect free for many years. If new problems arise, customer service listens and technicians respond quickly. Highly recommend. Very happy the lady bugs are out of the house. Have not seen any spiders or ants. Hopefully none will show up but I know if they do, all I have to do is call Terminix and they will take care of it. The Terminex staff are professional, thorough, and responsive to my needs. We have not had any problems with pests and the only bugs we’ve had problems with are the difficult to control stink bugs. Reliable, efficient pro's at what they do. I have only had feeding stations for a month and no activity yet. Am hoping next time there will be. Randy & Frank were wonderful! They were very professional and efficient. They were comfortable with our pets, too. I would highly recommend them and Terminix! Technician is always present and informative.